The Galaxy Radiator Sander is one of a kind, and one of the most valuable tools you can add to your floor sanding equipment. The Radiator Sander is extremely flexibly for finishing floor areas under radiators, around fireplaces and ‘tight spots’. With it’s 1.6″ clearance, the Radiator Sander will help you to provide the perfect finish while saving you valuable time instead of sanding these hard to reach places by hand. 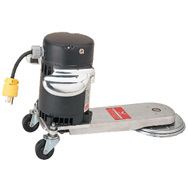 The powerful motor maintains a strong speed under heavy loads ensuring that the sanding disc continues to produce a smooth, consistent finish on all projects. The motor and sanding disc in the Radiator Sander have been balanced for vibration free operation. The Galaxy Radiator Sander is a ‘must have’ floor sanding product. Get yours today!